The file has at the top six color patches. At the bottom there are fourteen balls. The file has at the top five color patches. Well, in short that's just how bad the default profiles are, irrespective of the paper. I have attached the comparison between the default Canon's profile for their Glossy Photo Paper HG 255 and a custom profile, both on perceptual rendering, on a Canon PRO-2000. I have observed this quite some time ago and it immediately convinced me that creating my own profiles is the way to go. And the profile used is far from the best since the paper is OBA reach and the spectrophotometer was a Colormunki, with profile creates in ArgyllCMS. Well, you've proven that an image w/ out of gamut colors (for that printer/paper/ink combo) will print badly. Hmmmm. I am a lowly newbie in matters "color"
What surprised me, among other things, is that in the case mentioned this blue printed better from sRGB than from ProPhoto. I beg to differ. I have cut out specifically the blue balls part of the Tiff image and the Gamutvision clearly shows no out of gamut color for my printer/paper/ink combination. More so the situation it's the same in RelCol intent where possible out of band would definitely look worse. I suspect it's rather a gradient reproduction problem in the original profiles. Anyway interested to get others opinion too. Maybe my procedure was incorrect? This, blue ball printing black, is a well known issue with many canned Epson profiles. It is not a technical profile defect. Almost all the colors in the "blue ball" are imaginary in that they are outside of the CIE XY gamut. Further, they actually have a L* value below 1. In a sense they should be an extremely dark if not black, blue. You can check this by loading the image in Photoshop, converting to Lab colorspace, and examining the blue ball with the Info tab. Note the extremely low L*, which corresponds to Luminance. The reason that the ball doesn't appear black is because the conversion process to your monitor's colorspace raises the L* value. A lot. You can see how much by converting to your monitor's colorspace or, sRGB, Adobe RGB, or most any other standard RGB colorspace. However, the conversion to the printer device space goes through a completely different path. 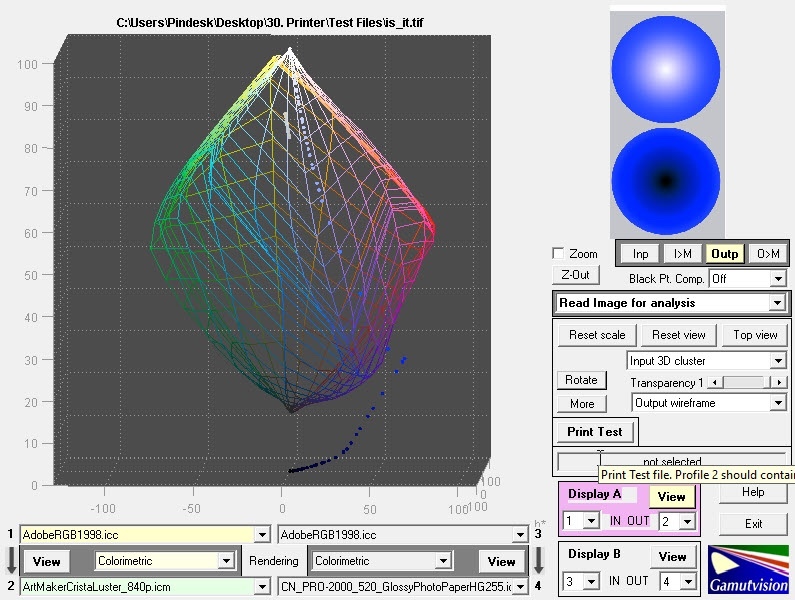 The Lab values are used to look up, in 3D LUTs, the printer's RGB values. Since the colors, being imaginary, are well outside the printer gamut how these are determined depends on the algorithms used to create the profile. There is no specification as to how OOG colors are mapped. If you compare this against a profile created by XRite, you will see the XRite printer profiles will raise the L* value much like conversion to standard RGB spaces. This has nothing to do with profile "accuracy." Both may print in-gamut colors accurately. And both should show softproofs that model what actually gets printed. If you look at the Epson softproof you will see the ball also comes out a dark blue/black while an XRite profile softproof is a much more pleasing blue. However, these Epson profiles are much more problematic when printing from ProPhoto when some of the colors are well outside the printer's gamut. This is most likely to occur when pushing saturation working in ProPhoto and not viewing the soft proof result. Especially with these Epson profiles. If you first convert the image to Adobe RGB or sRGB the L* will be raised and the blue colors will be turned into "real" colors inside the CIE XY gamut. Do this and examine the Lab values using the Info tab. 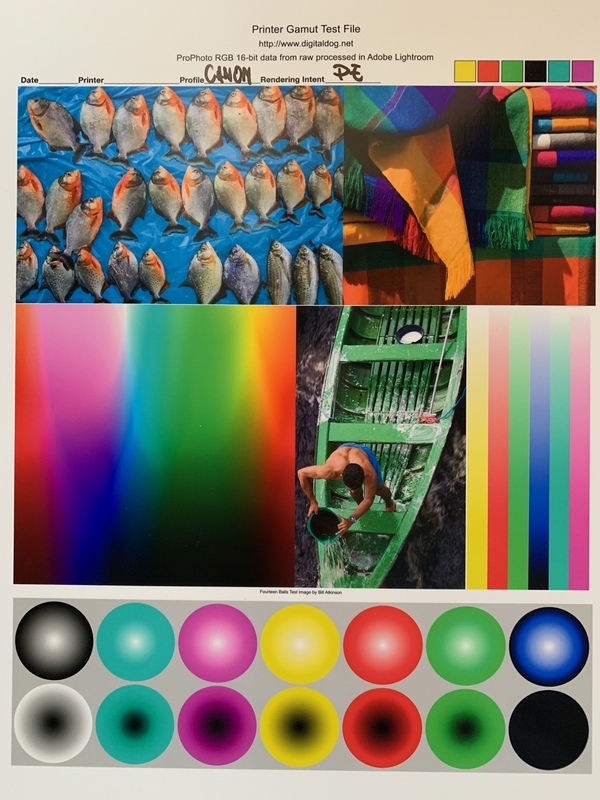 Since these colors are much closer to the printer's gamut, printing them will produce a reasonable blue ball with both the Epson profiles and XRite (or most other) profiles. I consider this image a good "gamut stress test" as it shows how smoothly the profile renders OOG colors. I like to use this, in combination with something like the Kodak DPI Colordisc image which is largely in gamut. That one should print good images with either profile. The profile created in ArgyllCMS aimed at perceptual rendering and using the ProPhoto colorspace as the source in ArgyllCMS while creating that profile? Or the simpler route in ArgyllCMS and aimed at relative colormetric rendering but used in Lightroom with perceptual rendering? Asking this because I wonder how much difference the two routes create. I guess you used the OBA compensation tool in ArgyllCMS given the ColorMunki does not go into UV spectrum. The bottom right blue ball is out of gamut. So much so that the colors are "imaginary." The RGB values go from (0,0,0) to (0,0,255). Since it is in ProPhoto RGB, the colors are all at the "blue" apex of the ProPhoto RGB colorspace. It's not only imaginary but has a luminance value (Y on the xy chart at the link) extremely close to 0. This is why viewing the colors in Photoshop as Lab shows L values of 0. Not sure what you did looking at it with Gamutvision but the ball is not even close to any printable, or visible for that matter, gamut. Argyll's OBA comp is designed to work with M0 spectros. The ColorMunki is a uV cut (M2) spectro and doesn't generate the OBA induced peak response in the low 400nm's. Not sure I got your question right? Are you referring to the "targen -c" preconditioning switch? If so, no I used one similar Canon canned profile to the actual paper I am trying to calibrate. Is this wrong? Should I be using a larger gamut .icc profile for conditioning? Information I have found on this aspect is confusing me. Thanks a lot for this comprehensive explanation! I must admit that while I'am new to printing, although I am learning fast, I am still very appreciative for all the time the wise & knowledgeable ones like you and others are putting up with the noobs. That's why I love LuLa! I couldn't help but went to reproduce the conversions you indicated and all is confirmed. However I still stick to my thoughts about the low quality of canned profiles. And it's not only Epson, same situation with the Canon ones on a PRO-2000. Aside, if one does not have access to custom profiles able to deal correctly with the OOG colors, as you've mentioned, their expectations towards accuracy in between the original image and the print are pretty much doomed. The double conversion (original gamut --> AdobeRGB --> Printer profile) could seriously alter some color, depending on how large the original picture gamut is and "particular" colors it might contain, correct? Well, I must admit i don't know what I did first but... I apologize! Actually, Those Epson profiles do have an actual technical defect. The AtoB1 and BtoA1 tables scale the printer's black to L*=0. It's kind of like baking in BPC in the Rel. Col. tables. This doesn't affect too much since most people use either Perceptual or Relative Col. with BPC. But it has one major issue. It screws up soft proofing which depends on accurate AtoB1 tables for all intents. Not a big effect with glossy types but a PITA with matte prints because of their smaller DMax. Combined with the rather odd way they map OOG colors, I too prefer XRite. Argyll also does a great job. I use Argyll for scanner profiling. XRite's scanner software is junk. It's really important to soft proof. Accurate profiles will show you what the print will look like properly illuminated regardless of how OOG colors are mapped because they contain accurate color info on all possible RGB values sent to the printer. See Andrew Rodney's stuff on setting up soft proofing and using printer profiles. They really are quite detailed and some of the best stuff for that on the web. I went off track there. You are right. I knew the ColorMunki is not measuring UV but should have looked up the ArgyllCMS tool features. There has been a discussion here where Doug Gray also took part in: https://forum.luminous-landscape.com/index.php?topic=106407.0 Graham Gill commented also. Lately I have made several ArgyllCMS profiles, both Relative Colormetric and Perceptual rendering (from AdobeRGB) aimed to see the differences but notice little color difference between them. As a start I selected AdobeRGB as the source color space as it fits my B&W workflow (AdobeRGB or Gamma 2.2 assigned) and I expected a better tone range (steps nicer separated, neutrality was always good) from a Perceptual rendering than from Relative Colormetric + BPC. I see in B&W at least that the mid range is lighter with Pr but shadow detail does not show a difference. Given the HP Z3200 has a gamut that does not clip AdobeRGB much the differences in color between the two renderings may not show. It could be that for ProPhoto they will show. Edit: Wonder whether the Joseph Holmes Monochrome "Color Space" for B&W with a better tweaked tone curve has enough advantages to switch to. Roy Harrington's Gray Lab space should be the same and sRGB has a curve with that approach too. 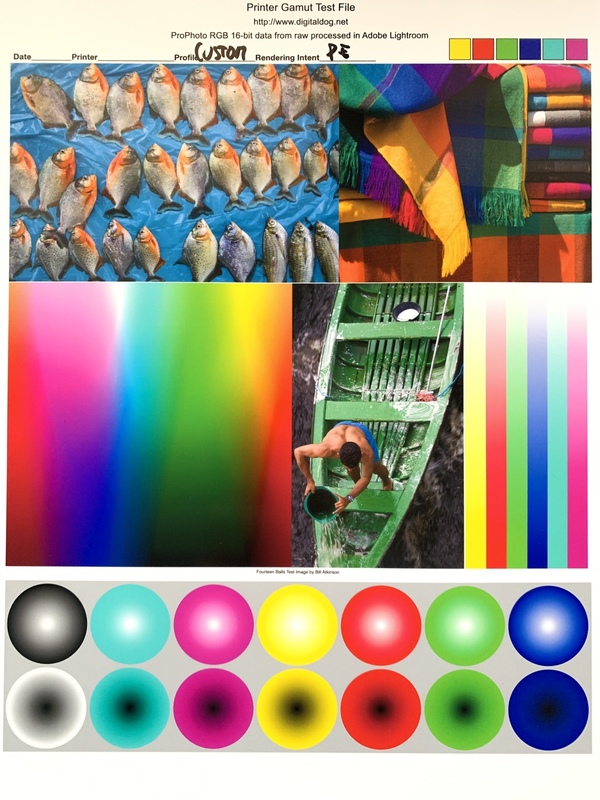 Compared to profiles made with iPublish, HP Color Center, HP APS (x-Rite too) the primary colors are more pure in ArgyllCMS, in particular the yellow. Whether that is more pleasing I still have to find out. For reprography the ArgyllCMS Relative Colormetric rendering is superior. Next step for reprography is a colormetric accurate camera profile, ArgyllCMS should have that tool too.